Ouch, Couch! 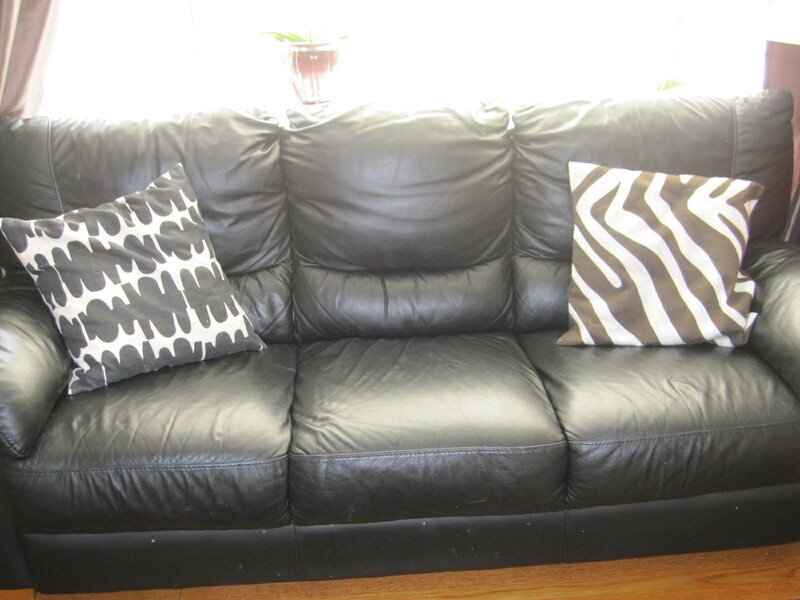 A Sad Sofa Saga…Part 1 | Laura's "Rules"
ISO: Someplace (safe and healthy) to sit. A friend of mine who runs an environmental organization wrote me after the New York Times piece came out a few weeks back to say two things: 1) Maya is very cute; 2) I should get rid of my couch. I wrote back to say, thanks! And that we have an Ikea couch, which should be fine. And she wrote back to say, think again. Cue record scratch….here. The issue here is chemical flame retardants, which are in the foam and fabric of upholstered furniture (as well as car seats, and even strollers, which is really dumb. Watch out, the stroller’s on fire!). I had hoped we had actually solved this issue, because the flame retardants don’t actually stay in the furniture. Research shows that they get into the dust we breathe, and on the floor, where children play and crawl around. They’ve been linked to lowered IQ, cancer, thyroid dysfunction, lowered sperm count in men, you name it. One kind in particular, polybrominated diphenyl ethers, or PBDE, still has not been banned in the U.S., and gets a pretty bad rap, particularly as its been found in the blood of American toddlers at levels 3 times higher than even that of their parents (which in turn, is far higher than samples of the chemicals among Europeans). Turns out, I was misled along with everyone else. Back in 2009 and early 2010, when I was pregnant, I started doing all sorts of reading, which is what you do when you are, literally, the size of a sofa yourself. “Are you careful in your personal life to try and avoid PBDE-laced products?” I asked. Aha, I thought. A solution. So I called the Salvation Army, had them pick up my old couch and haul it away, and looked for a used, fugly Ikea sofa on Craigslist. Not only would I be skipping the flame retardants, I thought, but I’d also be picking it up after the formaldehyde and glues were done off-gassing. I went for their “leather” style, because it was less likely to be treated with stainguard chemicals. Now, that’s thinkin’. Of course we found one easily, and I turned my attention to oh, having a baby. Until a few weeks ago, when I got that good news/bad news email. In the meantime, the same Heather Stapleton continued looking into the issue. Given the timing, it was probably the minute after I hung up the phone with my Craigslist guy back in the spring of 2010 that she published her test results regarding what, exactly, were the flame retardants that Ikea and other manufacturers were using instead of PBDEs in furniture. Surprise! Turns out, Ikea is using a chemical banned from children’s pajamas after a huge public stink back in the 1970s because it causes cancer and genetic mutations known as “Tris” (or 2,3-dibromopropyl phosphate, for the chemically curious). Back then, they learned that children merely wearing these pjs ended up with flame retardants in their urine. And, according to such radical sources as the National Cancer Institute, Tris is a “potent” cause of cancer, 100 times more powerful than the carcinogens in cigarette smoke. (Source: Slow Death by Rubber Duck, at 102.) This is in my sofa and Ikea pillows, and likely the upholstered chair in my downstairs room from Ikea as well. Grr. Out of the frying pan into the fire, so to speak. Maya plays all over our $%#! sofa all day long. Just today, I caught her licking it, which is gross for a whole number of reasons. I’ll pick up tomorrow with part 2, in which I gnash my teeth into tiny nubs trying to find a decent replacement for the enormous, toxic, Ikea dust-magnet in my living room. This entry was posted in Environmental Health & Safety and tagged babies, baby, cancer, chemicals, couch, dangerous, Deca, dust, eco-design, eco-furniture, eco-sofa, environmental health, Firemaster, flame retardants, foam, furniture, green, harm, health, Ikea, infancy, infants, infertility Superhero, IQ, mommy blog, New York Times, parenting, parents, PBDE, PBDEs, Penta, risks, safety, sofa, sperm count, Stapleton, thyroid, Toxic, toxic chemicals, toxics, tris, upholstery by Laura MacCleery. Bookmark the permalink. IKEA International made a voluntary decision to abstain from the use of brominated flame retardants and antimony-compounds in 1998. The phase-out of these chemicals was completed in 2002. Today, all textiles, mattresses and upholstered furniture sold by IKEA stores world-wide are free of PBDE and antimony compounds. In Canada , the SULTAN mattress series has not been treated with flame retardants. Only mattresses sold in countries where there is strict fire legislation, at this time, the United States and the United Kingdom , have been treated with organic phosphor or nitrogen-based flame retardants. In countries without fire safety regulations, IKEA’s requirements are based on the Swedish, Norwegian and Finnish standards. IKEA ensures that these standards are met by choosing the right material for the product, by the design of the product, by good production control and by product testing. 1. No known carcinogenic substances are allowed in the products. Regarding emissions of volatile organic compounds to the indoor air, and in the absence of clear legislation in this area, IKEA follows strict limits based on a German guideline. Measurements cover both the short-term and the long-term emissions from products. For Arylamines, IKEA has a ban on such substances, which can cause skin-irritation and some of which are classified as carcinogenic. IKEA has banned the addition of Phthalate plasticizers to mattress-foams (using the list of substances banned by the European Union, applicable for children’s products, such as bite- rings and pacifiers). Similar requirements are relevant for latex used in mattresses (based on the environmental requirements of the European latex-producing industry). As a general rule, IKEA does not allow any addition of Biocides to the products. No use of Pentachlorophenol (PCP) or Lindane is allowed in the products. Tinorganic/Organotin compounds are banned by IKEA. Azodyes which can release carcinogenic arylamines are banned in all IKEA textile articles. There are strict limits equal to max 100 ppm on Formaldehyde (skin contact textiles). Flame retardants cannot be added, with the exception of those markets (UK and the USA) where legislation regarding fire safety makes this usage necessary. However, even on these markets, IKEA has a ban on the brominated flame retardants, PBDE and similar chemical compounds. Hi Corri, I so appreciate your sharing this email with us. But I have to say, as someone who writes a ton of manufacturers, this is the kind of email that drives me bonkers! So many times, you get a response that says, well, we don’t use this, we don’t use that! Notice they do not say what they DO use, which we know from tests by Heather Stapleton — not their own transparency — to be chlorinated tris, a mutagen banned in the 1970s from children’s pjs. I bought the sofa from Ikea because it had been advertised as PBDE-free, so I felt angry and duped when this came to light. And I personally can’t go into an Ikea because of all their use of pressboard and highly chemicalized wood products. In addition, their stuff is made to be put together once or twice and then be landfill-bound, making it cheap to buy but very environmentally expensive. It’s disposable, really. So to say I am not a fan is an understatement. In the end, beware any long, hyper-explanatory emails that nonetheless fail to say WHAT IS ACTUALLY being used, and instead is a long song and dance about what it is NOT in a product. It’s like advertising potato chips as gluten-free. It may be true. They’re still not good for you.